Spanish artist Jorge Alderete has sent us this cartoon about Lance Kaufman a/k/a “Karla Pundit.” For those not familiar with “Karla,” he composed and recorded a Dionysus album titled “Journey to the Ancient City” at our short lived vintage studio (ie: old stuff that kept breaking down) in Eagle Rock, back in 1995. Lance was the original keyboard player in Yard Trauma as well. If you love exotica, this album is a must have. Look for it in our online store and enjoy the comic. English translation below. Thanks Jorge! My name is Lance, Lance Kaufman, but I am better known as… Karla Pundit. These days I live in the middle of the Arizona desert. Many people think I am crazy. 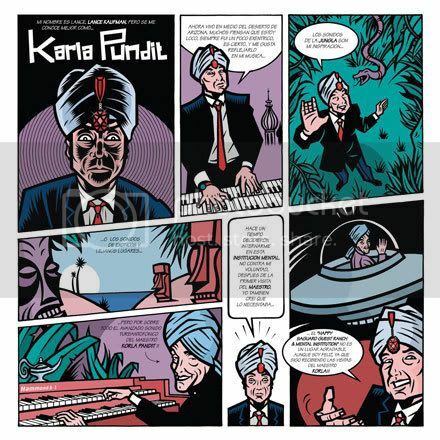 It is true that I have always been a little eccentric, and I like to reflect that in my music… The sounds of the jungle are my inspiration…..as well as the exotic sounds of faraway places……but most of all the advanced turban-tone-stereo sound of maestro Korla Pandit!!! A while ago they decided to put me in this mental institution, and not against my will: after the maestro’s first visit, I too believed that I needed it. The “Happy Saguaro Guest Ranch and Mental Institution” is not a very nice place, but I am happy here since maestro Korla visits me regularly!! !